Christina Fong. Photo by Dru Abrams 2006. Suggested venues for the study of Karate in Massachusetts and Vermont. Waving Pines Dojo in Brattleboro, VT.
New England Shotokan Karate-do, East Longmeadow, MA. The Japan Karate Association of Boston, Boston, MA. Announcing House of the Waving Pines Dojo in Brattleboro, Vermont! Training held weekly: Monday, Thursday: 6.30pm-8pm. Congratulations to Alice Scudder on achieving the rank of Yondon (4th Degree). Where are your dues to the University of Massachusetts Shotokan Club going? Background and history on dues at the Umass Shotokan Club: Prior to 2007 there were no dues paid to the club for instruction. The club was allotted $1300 per semester by the Student Government (SGA) and that money was used to secure instruction or training space. Read on for why in 2008 the Club democratically voted to impose dues and how those dues together with the existing $2600 annual budget were voted to be dispersed. In 2006, Sensei John Nunez, a karate Master, Chief Instructor for the country of Belize and PhD student at the University, began principal instruction at the club. Once the club realized that Sensei Nunez was leaving campus to return to his native country, Belize, we realized that in order to maintain the high level of instruction he was offering we would need to be able to budget bringing in instructors from ISKF headquarters in Philadelphia as often and regularly as humanly and financially possible. Prior to this point Sensei Nunez was offering his services at up to 8-10 hours per week for solely the amount that the RSO was budgeted by the SGA. He was truly charitable with his time as the going rate for ISKF Master Level instruction is in the $100 to $120/hr range! We estimated that the cost to bring an instructor from Philadelphia might cost as much as $500 to $700 per session. This cost estimate was based on a roundtrip airplane ticket ($250), Per Diem fee ($150), $120/hr instruction fee ($240); in the event of an overnight stay (add $79 for hotel and another $150 Per Diem). However, we realized that in order to secure training at an equal quality level and for an equal amount of hours we would need something like $15,000 a year, not just the $2600 that was coming from the University and that club dues if initiated, and with a large enough student base *might* actually come close. So, Dru Abrams with the assistance of Jared Carver (at that time a Shodan) put together a plan to make sure that the club would continue to get high quality, Master level (Godan or higher) level instructors visiting the university at least 3 times per Semester and that the club could pay for this with dues. We were hopeful that with large student enrollment in the training program we might be able to afford many more than 3 Master Level training sessions per semester. 1) Master Level Instruction - at least 3 visits per semester by a Karate Master from ISKF Headquarters. Anticipated cost for this would be $700 per visit including per-diem, transportation (airfare/taxi) and instruction costs. 2) Funding for at least 2 ECCKU tournaments a year with a minimum budget of $700 per semester. 3) Additional funds in the treasury would be used to supplement these expenses and allow for additional Master Level instructors and additional tournament trips. 4) It was specifically discussed that existing club membership would continue in a key leadership and instructional role with black belts leading day to day training but in a non-paid capacity. All funding would be allotted to goals 1 through 3. Existing black belts including Briankle Change, Alice Scudder, Jared Carver, Max Le and Sensei Nunez agreed that the most important thing the club could do is continue to receive the very highest level of training possible and as regularly as possible. Training received from a high-level instructor benefits every rank of Karate-ka. High level instructors simply have more experience in teaching than junior instructors. 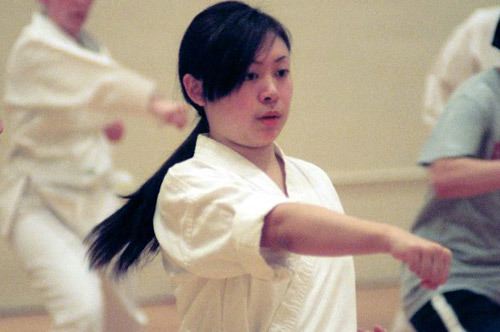 They notice details even in senior students and can help all levels of karate-ka improve their technique and understanding of karate. A junior instructor simply doesn't equate with a master level instructor. Wouldn't you love to have access to these masters multiple times per semester!?! After all, what's the point in membership in the ISKF if not to have access to these master instructors? So, Where are your dues going? Are you receiving Master Level instruction on a regular basis? Is the club paying (and paving) the way for an active tournament participation every semester? Are club officers fully transparent in their collection and disbursement of all dues including cash acceptance of dues? Between 2007 and 2008 several attempts were made to encourage the Club's officers to disclose the account balances for the Club to no avail. Its extremely important that the club's officers fully disclose not only dues receipts but bank account deposits in order to maintain transparency and insure that no dishonest bank keeping is permitted among officers. Further, there must be a clear chain that traces dues, deposits and expenditures. While no misappropriations were ever alleged, without transparency there is no way to insure that the RSO is functioning in a moral and legal way. Its all too likely, and unfortunate, that monies collected by the club, in a seemingly democratic method, could go astray. Further, its very likely that collected funds could be diverted in a nepotistic manner. I.e. without oversight by the club body at large, or the University, funds might be channeled towards any number of inappropriate avenues. Since the very collection of funds from club members was elected for a single purpose, and yet that purpose was never realized, it is entirely possible that any number of misappropriations might occur in the future. It will be the responsibility of the Club itself, and therefore the individual club members, to demand that officers be forthcoming with dues allocations, dues deposits, dues accounting, etc. Unfortunately, the reality is that the frequent turn-over of both officers, and Club members only fosters the abuse of funds. It will be up to the current and future members of the Club to demand that their officers provide complete transparency. The reason for the inception of dues was to insure top-quality instruction. As a democratic body and University group Club members can demand that dues are dispersed in accordance with the priorities established in 2008 with the highest priority being Master-Level (Godan plus) instruction as frequent and regularly as the club's finances may allow. Anything else is doing a disservice to all levels of Club karate-ka and the intentions of those who voted for the inception of dues for the betterment of future generations of Club members. This site has no affiliation with the University of Massachusetts or the Shotokan Karate Club.